For some reason when I try to cut a 45 in a piece of maple beading, the cutoff gets kicked back. This has happened a few times today, and if I hadn’t been standing to the side, would have been serious. I’m sure this is a technique issue. Can anyone help? Rather than a picture of the work piece, how about a picture of your setup and a description of what you do. Are you using a miter gauge? A sled? Tilting the blade to 45 or is it at 90 with the work piece at the angle? Too many possibilities to venture a guess without more information. Good point, K-zoo. I’m using an incra fence and shop stop with their v-27 gauge. The picture is how I have it set up. It looks like the rounded part of the beading is down on the table. My guess is that without a flat surface on the table the cutoff is rolling on the curve and somehow contacting the blade. 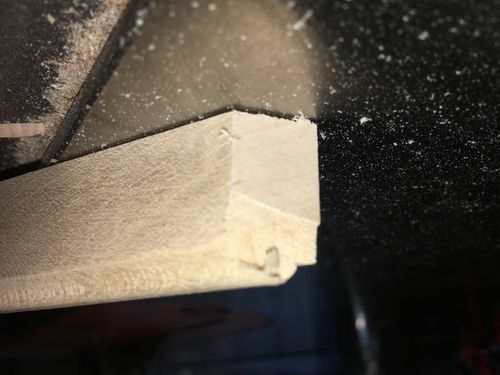 If that is the case you could either flip the work piece so the flat is on the bottom (that would require you to set up the cut differently) or perhaps clamp a piece of stock to what will be the cutoff so that it will not roll. The latter would only work if the cutoff piece was long enough for this to work. protection and stand out of the way. I never thought about the rounded edge causing that, but it just about has to be that. Thanks! After I posted I thought about it some more. I think that if the cut off rotated back towards the front of the saw it would be fine, but on the occasion that it rolled forward then the top edge would definitely hit the blade. Perhaps suit up in hockey goalie gear? kick-backs can be caused from a number of reasons – all of which could lead to catastrophic injuries !!! standing to the side of the direct line of fire is a good habit to get into. believe-you-me, a chunk of wood in the face is no picnic !!!! 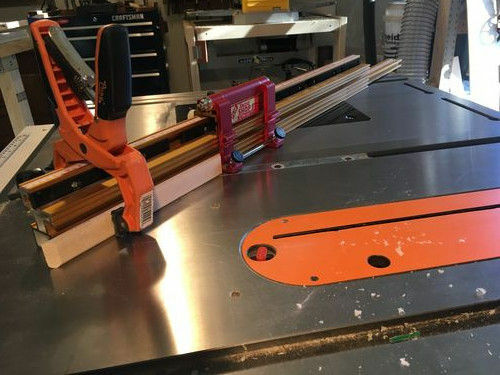 do you have a full table-sized sled for your table saw ? Before I built a sled, I used an Incra fence to cut thousands of miters and I still do for angles other than 45. I have never had the kind of trouble you are describing. There is something else going on here. Perhaps your blade isn’t aligned very well with the miter slot? Is the kickback occurring after the wood has gone past the down traveling teeth and is contacting the up traveling teeth? Could it be that you don’t have good tight control of the wood as it passes over the blade? There are many potential root causes. 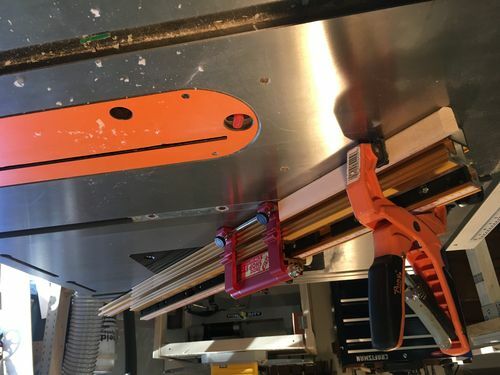 I agree with John that you really need to build crosscut and miter sleds, even though it will be a lot of trouble to get them dead accurate. There are a lot of instructions on how to do this on the internet and especially Youtube. You can also buy commercially built sleds and some of them have adjustable angles. I don’t think they are as good as a good shop built one though. Another vote for the rounded side being down as being the main culprit here. As Loren said, small cutoffs are prone to this. I think becasue they are more easily affected by the last bit of cutting and can more easily move due to their light weight. But with that rounded off side down, the cutoff cannot stand on its own and is going to move and I think whether it falls forward or back, the angle cut ensures it will rotate into the blade. I don’t think this was mentioned, but another idea would be to put on a wooden extension to the fence. Something that would allow you to clamp the cutoff to the fence. And of course being a wooden extension you can cut right through it. Obviously this extension needs to be tall enough it remains whole after you cut part way through it. And I know John knows what he’s talking about when it comes to kickbacks. He definitely got my attention with his story and photos of his accident. Are the cutoff wedges getting in the gap in the insert? If so a zero clearance insert will fix it. a closer look at the arrangement. +1 Especially if the small chunks of wood are angled. It’ll be easier for them to try to wedge themselves into the space between and become little projectiles. I’ve had the blade create enough air movement to pick small pieces up just enough to drop them back on the spinning blade where they then shoot off in a totally random direction. Maybe a full face shield may be a worthwhile investment. Good comments on the insert slot, but take another look at the first picture the OP posted. I doubt that a piece that size got in the slot. I think I got the rotations reversed in my second comment. 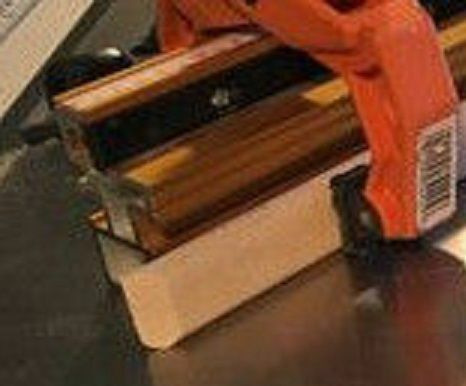 Based on the angle shown in the picture, a piece rotating back towards the front of the saw would strike the blade.